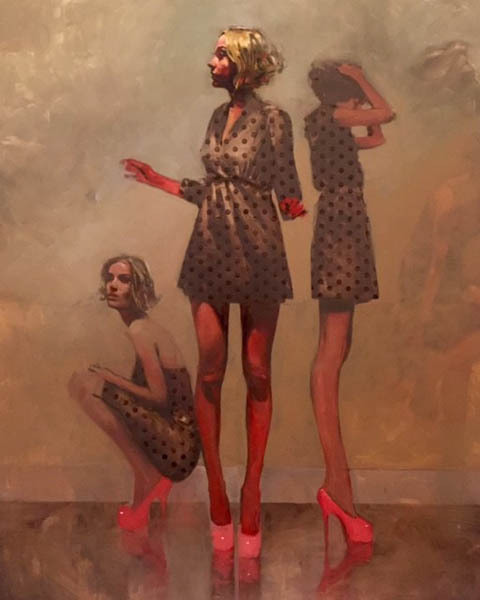 Art world gorgons are increasingly agog over the Arizona based figurative artist Michael Carson. Critics have dubbed him‘’the post-millennial Toulouse-Lautrec’’, who of course was the famous French Impressionist painter known for his classic canvases documenting the French bourgeois of his day. If all this ‘artsy-fartsy’ hyperbole is all a bit too much to digest then let GW break it down for you. 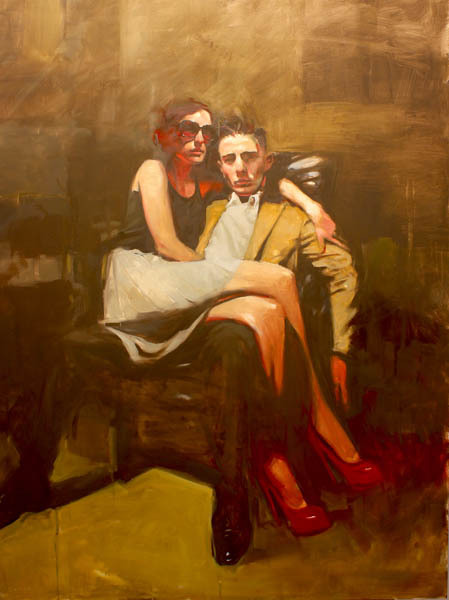 Michael Carson is the most attuned figurative artist in America today. He is the modern master of color and light and his pseudo-realistportraits of the bon chic and bon genre of our time astonish and delight and his signature strokes are immediately identifiable.A graduate of the Minneapolis College of Art and Design his volition is to emphasize the relationships of color and light and allow the texture of his brush to move a viewers eye through the art. Like Jean-Antoine Watteau or Henri de Toulouse-Lautrec who back in the 18th Century were regaled for their ability to define their times the lives and loves and the ‘fete galantes’ (grand parties) of their era. This American artist sets his glamorous settings in the bars, the clubs, cafes and dance studios – all the usual haunts of the beau-monde of contemporary Americana. His works, all oil on canvas, glow with a wide lens perspective. 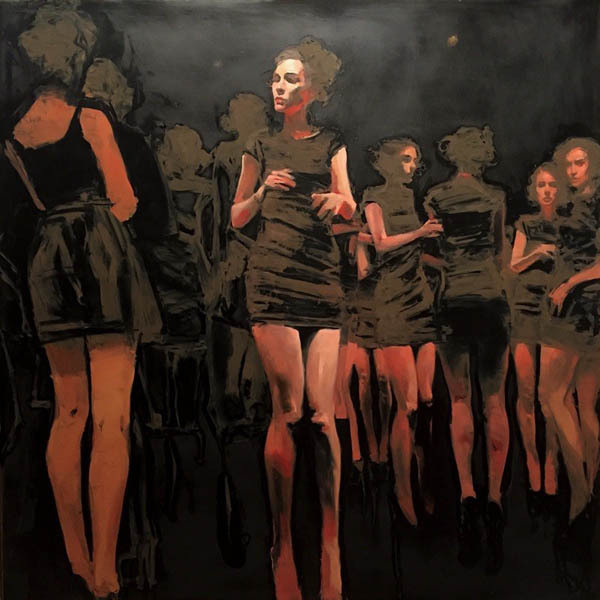 And his subjects are neither exaggerated and neither subtle despite the ‘’Pallor Noir’’ as GW now dubs the signature palette backdrop that makes a Michael Carson canvas immediately identifiable. What is most notable about this artist is the deft way he brings to life the emotion, the effortless nonchalance and cool-that perfect je ne sais quoi. ‘’I am most interested in the subtleties of facial expression and spend most of my time on my subjects face and hands because for me they tell the story.’’ the artist declares. 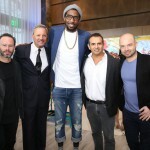 And that story will surely surge to the forefront of art conscious New Yorkers come this coming Fashion Week season when the artist’ first solo show debuts at the Georges Berges Gallery at 462 West Broadway this early Autumn. GEORGE WAYNE – Talk to me about the symbiosis of color and light with regards to the texture of your work. 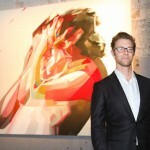 MICHAEL CARSON – It really changes from piece to piece. The connection between all these things is always there. Almost as if they are one in the same thing. I try not to differentiate these to be solitary ideas but rather, to just paint and allow for my instincts to come through. To have faith in these artistic instincts. GW – Do you call yourself a portrait artist? MC – I don’t consider myself a portrait artist. I consider myself a figurative artist. The distinction being that a portrait artist is attempting the likeness of their subjects and although I use a model or reference in my work, it is imperative that I have the freedom to deviate from it at any time to achieve the finished result that I want. This is to me far more important to me then any academic exercise. 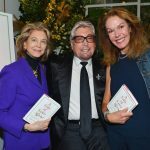 GW – How have you been feeling with regards to this show in New York? What has been the mood in your studio down there? What has been the source of inspiration? 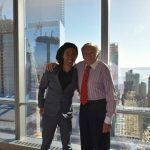 MC – Of course the idea of having an opening in New York is exciting. But as an artist, an important element is the deadline. The motivation to know that at this date, I’ll have to stand in front of the entire body of work and present it to the public. As far as inspiration, it is still the same thing that has always motivated me. The figure. That is a starting place. 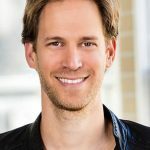 The other things that have been driving me is the experimentation of technique as well as material. Finding new ways to manipulate paint or surface to change the feel and mood of a piece. Its the thing that keeps the work fresh and exciting in the studio. If I find myself getting bored during the process of creating, it is the death of that piece. It’s about constant evolution and experimentation. The mood is bordering on solitude and inward thinking. Its a reflection on what i am observing. The subtleties in the expression that tell you an inward dialogue is happening even though there is hardly anything happening at all. Look around you. Most people are appearing to do nothing. Or some mundane job or activity. Its whats going on inside that is exciting. So people should be able to view my work and take from it different ideas or moods. GW – What themes are your feeding off that will inspire your show this September in New York City at the Georges Berges Gallery? MC – I look at every painting as its own entity. If I do stay on a specific theme it is almost always and unconscious decision. I tend to stand in front of a blank canvas and allow the ideas to come to me as I work. Its like free association. Of course, with that you have a bag of tricks that you have been amassing that you pull from. so The work can look like a collection but the intent is to give each piece its own life. I love the large multi figured compositions that imply models backstage or people waiting. The idea is not to give it a specific narrative but rather create the composition and allow the intricacies and details of the pose and expression to allow the viewer to create their own story based on where they are coming from or the mood they happen to be in at that time. GW – What was your graduate thesis at the Minneapolis College of Art & Design? MC – It was horrible. I had the maturity of a 10 year old. I was a design student at the time. I had never even picked up a brush yet. I knew that I was heading towards a creative future but the idea of painting didn’t even come into the picture for another 6 years. I literally found painting by accident. Or rather that painting found me. GW – How did you end up in Phoenix, Arizona? And how has that move influenced your work? MC – It was always my intention to travel and leave my home town of Minneapolis. It just naturally changes to work. Again, it is an unconscious thing that happens. As an artist I just exist and observe and create. And all the colors, music, people and culture of a place just sinks in. I think that is my job as an artist. In fact, I wish that I could move more often. I don’t think I would have ever considered the southwest as a destination but my wife’s job brought us here and I thank God it happened. Its when I first realized the power of travel as it related to my art. GW – What would you consider the signifiers of your work? 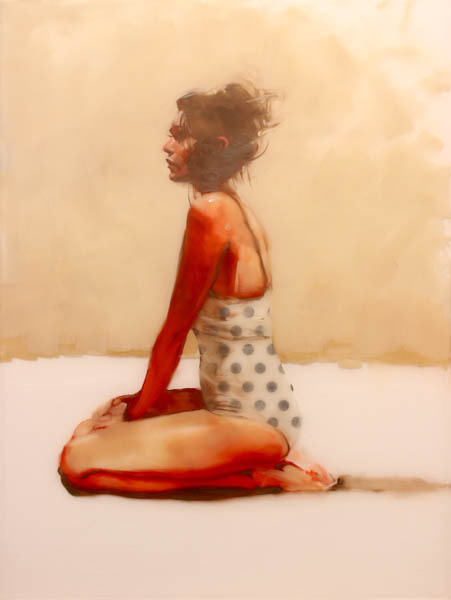 When I see a Michael Carson canvas GW immediately knows! I love that your work has such a strong signature. MC – Technique quickly becomes everything to me during the process os painting. I love to spend time on faces and subtle poses that tell a story of it in itself. But the act of putting paint on surface is equally exciting to me. It’s here that I think the artist’s “fingerprint” is found. That thing that differentiates one from another. The good experiments stay with you and travel into future paintings just as the failures teach you what is not working. One is not more important than the other. As long as you learn from both. I love to have this duality in my work. On one side of the coin you have a painting that you can look into. It is a space with a figure and depth and perspective. On the other side, I love to force the viewer to the surface by manipulating the paint. By blending fore and background. by printing flat patterns that do not follow the form they lay on top of. By allowing drips to cut through the different depths of the piece. By wiping away paint to create a stained translucent effect. All these things and more. They all add to change the viewers perspective and hopefully, force them to really get up close and see the brush work and the layering and other things that happening on the surface. 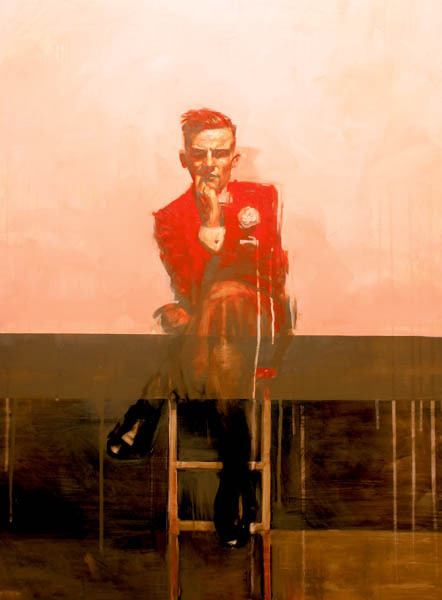 GW – Would you consider yourself a ‘’modern master of the figurative study’’ ? That is GW’s inherent declaration here! MC – I consider myself a student of figurative study. Always learning. Always wanting and waiting for something new to excite me and motivate me. I never want to be someone who isn’t searching. I never will consider myself and expert. Time has taught me this. As I look at older pieces i’m conscious of how the work is evolving. I realize that I will always be a student. I’m hopeful of this as well. GW – Inspiration you say ‘’comes from architectural interiors and fashion’’. I love that statement from you. Give some more detail and explain what you mean.